The Executive branch consists of the Governor of Alaska, the Lieutenant Governor of Alaska, the Governor Cabinet, Executive Officials and State Agencies. The Governor is the chief official of the Alaska Executive branch. The Governor serves the state for four-year terms. The Alaska gubernatorial election is held every four years to elect the governor and the lieutenant governor. The governor can exercise his/her executive power and functions as the commander-in-chief of the states military forces, Alaska National Guard, and Alaska State Defense Force. He/she can exercise some judiciary power to a limit that he can excuse convicted criminals except in the cases when an official is convicted of unlawful activities. The governor of Alaska also has the unilateral power to forbid bills passed by the state legislature. Office of the Governor of Alaska. In the Primaries, the governor and the lieutenant governor run on separate tickets but during the general election, both run together on the same ticket. The lieutenant governor serves the state for four-year terms. He/she is the second in line to succeed the governor of Alaska. 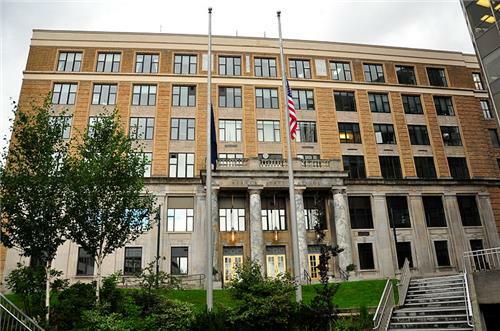 The Alaska State Legislature is the body of the state government of Alaska which is divided into two separate assemblies, namely Alaska House of Representatives and Alaska Senate. The legislature meets in the State Capitol building in Juneau. years of age and must be a resident of Alaska for at least three years and a resident of the district form which elected for at least one year. The Speaker of the House is the presiding officer of the assembly who is elected by the members of the house through a House resolution. The Speaker delegates the duty to the members of the house. The Alaska Senate, consists of 20 state senators , is the Upper House of the Alaska legislature. A senator serves four-year terms. The Alaska Senate is the smallest upper house state legislative in the United States. The Alaska senate has the law making power and may also approve or reject appointments to the state cabinet and boards. Additionally, the senate revises the revenue bills proposed by the House of Representatives. There is no limitation to the number of terms the members can serve. For more information on Alaska Legislative Branch Click here. The District Courts- the primary misdemeanor trial courts. An Appellate court is a court of appeals that has the legal power to hear an appeal of a trial court or other lower courts. The Appellate court is divided into two sections: the Supreme Court and the Court of Appeals. The Supreme Court of Alaska is the court of highest appeal in the state of Alaska and has the exclusive judicial powers over criminal and civil matters. The Supreme Court reviews all the decisions of the intermediate courts.The Supreme court consists of a chief justice and four associate members, all appointed by the governor of Alaska. The Alaska Court of Appeal is the court of intermediate appeal and was created on 1980 by the Alaska legislature to minimize the workload of civil matters of the Supreme Court of Alaska. The Court of Appeal consists of a chief judge and two associate members, all elected by the governor of Alaska. The court of appeal has the legal power over the criminal and quasi-criminal matters instead of civil matters. It has the jurisdiction on cases related to juvenile offending, cases related to pay roll and probation decisions and also in cases in which the prisoners are challenging the custodians (Great Writ). The court of appeal may review the resulting decision of the Supreme Court as requested by the defendant in a criminal act which have been tried in the district court or the court of appeal can refuse to hear the appeal altogether. For more information on Alaska Appellate Courts Click here. Most Trial Courts are the court of records in which evidences and testimonies are recorded and maintained under the rules of evidence and all the findings of facts are made under these evidences. The trial court is divided into two levels: the Superior Court and the District Courts. The Alaska Superior Court is the main arm of the Alaska trial courts. The superior court is the court of general appeal and there are forty-two Superior Court judge ships in the four judicial districts of the state. The superior court hears all criminal and civil cases which are not taken to the Supreme Court. The court hears cases related to abused children or juvenile offending and also cases related to property disputes. The superior court rarely hears those cases brought in front of the district courts. The decisions of the superior court are reviewed by the higher appellate courts. The Alaska District Court is another component of the trial courts and is limited to subject-matter-jurisdictions. The district court has twenty-one judge ships having the legal authority to issue arrest and search warrants. The district courts hear cases related to domestic violence, small claims disputes involving an amount of $10,000 maximum , civil cases involving an amount up to $100,000, preliminary or first appearances in felony cases, state and city infringements, and also cases related to children on emergency basis. For more information on Alaska Trial Courts Click here. Monday - Friday, 8:00 am - 4:30 pm. Anchorage, Fairbanks, and Palmer courts have expanded hours for specific cases. The Department of Tax Revenue Decision in Alaska oversees all the state revenue sources that directly affect the tax decision. Alaska is one of the states of the United States of America which has no sales tax or individual income tax while 89 municipalities levy local sales tax from 1.0-7.5% . Other local taxes collected include hotel, motel, and bed and-breakfast bed taxes, liquor and tobacco taxes, severance tax, fuel transfer taxes, raw fish taxes and tire taxes. Revenues collected from petroleum and federal subsidies are the primary revenues to finance the state government operations. Alaska has one of the highest property tax rate in the United States. The state collects an average of 1.04% as property tax rate. Each county in Alaska has its own rules and methods of collecting taxes and the property taxes are collected on a county level. Fairbanks levies the highest property taxes in the state . The Department of Administration is the chief executive office that renders administrative services related to finance, labor, space leasing, postal, telecommunications systems, property management and also manages the state owned buildings in Juneau. The department has many divisions, divided into external service providers (motor vehicles, office of public advocacy, public defender agencies, retirement and benefits, and internal service providers (administrative services, enterprise technology services, finance, general services, personnel and labor relations, risk management). For any information on Alaska Department of Administration and its divisions Click here . of education and also to improve the academic success rate. The core services include: public school funding, fiscal accountability, compliance and oversight, school effectiveness programs and active partnerships with government, public and private entities for the efficient working of the department. For any information on Alaska Department of Education and Early Child Development and its various programs Click here . The Department of Health and Social Services work efficiently to improve the health and living standards of the community by implementing many health regulation services and policies. The various agencies and divisions which work under the department are: Health Care Services, Juvenile Justice, Public Health and Services, Seniors and Disabilities Services, Office of Children’s Services and Behavioral Health. For any information on Alaska Department of Health and Social Services and its agencies Click here. The Department of Law regulates the law and order of the state of Alaska. It serves the state to settle all issues involving civil and criminal matters. The Attorney General is the chief law enforcement officer of the department. The divisions of the department include Civil division, Criminal division, Regional district attorney offices and administrative services. For any information on Alaska Department of Law and its divisions Click here. The Alaska Department of Public Safety is the department which is responsible to protect the people, property and wildlife resources of Alaska. The department also regulates and maintains law and discipline in the state. Under the department of public safety, many other divisions work concurrently including: Alaska State Troopers, Alaska Wildlife Troopers, Alaska Police Standards Council, Fire and Life Safety, Council on Domestic Violence and Sexual Assault, Office of the Commissioner, State-wide Services, and Administrative Services. For any information on Alaska Department of Public Safety and its divisions Click here. The Department of Commerce, Community and Economic Development aims in promoting a strong economy and communities and also to protect the consumers in Alaska. There are many corporate agencies working under this department, namely, Alaska Industrial Development and Export Authority, Alaska Energy Authority, Alaska railroad Corporation, Alaska Seafood Marketing Institute, Alcoholic Beverages Control Board, Regulatory Commission of Alaska and Alaska Gas line Development Corporation. The various divisions include Commissioner’s office, Administrative services, Banking and Securities, Community and Regional Affairs, Corporations, Business and Professional Licensing, and Insurance. For any information on Alaska Department of Commerce, Community and Economic Development and its divisions Click here. The department of Transportation and Public Safety is an extensive department within the government of Alaska encompassing numerous divisions and sections. The department oversees the central, northern and the south-east regions of the state and implements several programs to make travel safe, fast and convenient. The department manages and provides various transportation facilities, comprising roads and highways, aviation and airports, ferries, railways, bicycles and pedestrians. For any information on Alaska Department of Transportation and Public Facilities and its various divisions Click here. The Department of Military and Veteran Affairs is a significant department which tends to the military and veteran affairs of the state of Alaska. The department serves as the guardian of the state and works concurrently with the sub-departments, including Alaska Army National Guard, Alaska air national guards, Alaska Aerospace Corporation and Division of Homeland Security and Emergency Management. The department tends to all veteran affairs of healthcare benefits, employment benefits, education benefits, real estate, permits etc.